At first glance, OnePager and Swimlane Timeline may appear to be able to generate the same types of timelines and Gantt charts. However, OnePager excels at ease-of-use, flexibility, and overall application performance and stability. Swimlane Timeline's reliance on outdated Visio technology ultimately limits its ability to offer what OnePager does, despite comparable pricing between the two applications. OnePager also offers best-in-class technical support. Have a question? Just call us--we'll be happy to help, and we won't charge you by the hour! In the meantime, we've prepared a side-by-side comparison of some of the most important features of OnePager and Swimlane Timeline below. OnePager is a leading project reporting application that interfaces with Microsoft Project, Project Server, Project Online, or Excel. OnePager creates presentation-ready Gantt charts and timelines that can easily be shared in PowerPoint, PDF, or SharePoint. Swimlane Timeline is a Visio plug-in that can import data from different Office applications such as Project or Excel. 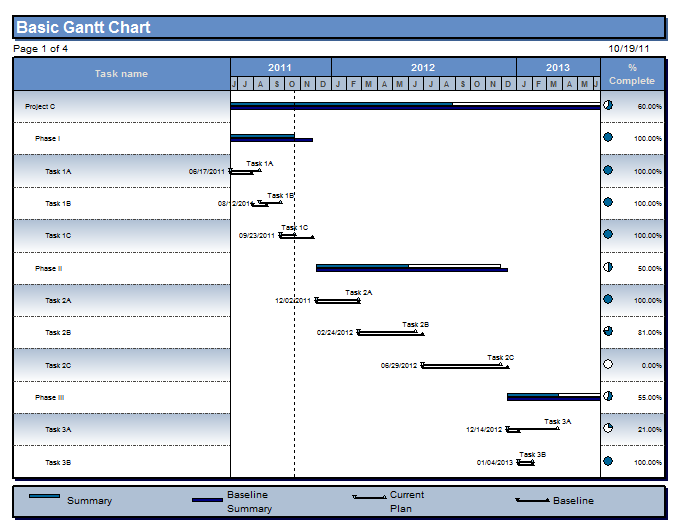 Swimlane Timeline's project reports are created as Visio diagrams. Installs as a standalone application, with the option to also launch from Microsoft Project or Excel as an add-in. Visio add-in. Visio licenses must be purchased separately at an added cost in order to use Swimlane Timeline. OnePager can be run as a standalone application and can launch independently from Project or Excel. This is increasingly the preference of corporate IT departments, since certain add-ins can pose security risks. Organizations that prefer add-ins may continue to use OnePager as an add-in. Swimlane Timeline only works as an add-in. While not a security risk itself, IT departments often blanket-disable add-ins for security reasons, which blocks Swimlane Timeline from running. OnePager works with all international and regional Windows configurations. Only works on computers using English (US) Windows settings. International settings are not supported. If you want to run Swimlane Timeline successfully and are outside the US, you have to switch your computer into US settings. When a new version of OnePager is installed, all reports are automatically converted to the new version without any work required by the end user. When upgrading Swimlane Timeline, users must manually create custom Visio styles to protect each and every timeline from corruption. For multi-page reports, this process must be performed for each page. 40 seconds to create a timeline from the same data, more than five times slower than OnePager. 314 seconds to create a timeline from the same data, more than 20 times slower than OnePager. In two of the three timed tests, Swimlane Timeline crashed Visio before it ever created a timeline. 62 seconds to create a timeline from the same three files, more than five times slower than OnePager. Submit a support ticket by phone, by e-mail, or online and receive a confirmed case number within minutes. All tickets have a guaranteed response time. FREE new-user orientations held multiple times per week. Searchable wiki with hundreds of in-depth articles covering basic to advanced features. Searchable FAQs updated with each release. Import one or more Microsoft Project schedules quickly and easily. No need to pre-load anything into Microsoft Project first. OnePager does its import behind-the-scenes, so that users don't have to see the inner-workings of the application. Swimlane Timeline requires that documents be opened in Microsoft Project before they can be read. This means that you either need to open your Microsoft Project plan(s) before starting Swimlane Timeline, or that Swimlane Timeline needs to do it for you. When Swimlane Timeline opens and imports plans from Microsoft Project, there is a lot of flashing of different windows open and closed, which can be jarring to end users. Quickly and easily build a timeline from multiple Excel or Project plans. OnePager can import multiple files simultaneously with minimal disruption to the end user. While multi-file reporting is technically supported, each file must be opened individually in Microsoft Project or Excel, which can take considerable time and system resources. In some cases, this can cause Project or Excel to crash because it runs out of memory due to having opened and closed too many files in rapid succession. Swimlane Timeline's need to read data through an active Microsoft Project/Excel session also means that windows are popping open and closed on the user's screen, which can be quite disruptive. OnePager connects directly to your Project Server environment, eliminating the need to open one or more Project Server documents locally on the desktop before creating a report. OnePager uses Microsoft's latest Project Server APIs, meaning that OnePager can create Project Server reports even if Microsoft Project is not installed on the end-user's computer. Swimlane Timeline can read Project Server data, but only if the data is passed through Microsoft Project first. This means that anytime a user wants to create or update a timeline, the Project Server document must be loaded into Microsoft Project. Depending on the size of the schedule, this can take considerable time and system resources. Direct connection to Project Online, just like Project Server. No local Microsoft Project installation is required. Only reads Project Online data through Microsoft Project. This often requires a paid upgrade to later versions of Microsoft Project, since most earlier Project versions do not support Project Online connections, and therefore cannot be used by Swimlane Timeline. Create multi-page project reports with an unlimited number of tasks. OnePager will automatically insert page breaks as needed, or you can customize where page breaks appear with an easy drag-and-drop interface. Advanced page scaling and fitting are also supported. Users cannot edit a multi-page document after it has been paginated, since it is no longer in Visio after exporting. OnePager's patented conditional formatting engine lets users automatically control the color, shape, size, border, and font of items on the timeline, all based on existing Microsoft Project or Excel data. No programming experience is required thanks to an intuitive point-and-click conditional formatting wizard. Swimlane Timeline requires users to write expert-level XML code in order to automate any timeline formatting. In many cases, such configuration requires the expertise of an expensive outside consultant, since it is not within the skillset of the average project manager. OnePager's patented snapshot capability allows a single timeline to have multiple versions at different dates. This allows for project managers to create an audit trail week-by-week or month-by-month, tracking project changes over time. With a single button click, OnePager will reimport data from Project or Excel and update any changes to the timeline in real-time. All updates are done quickly and seamlessly, so that the end user gets updates instantaneously. Swimlane Timeline does allow for updating, but it is more involved than OnePager. As is the case with building a new Swimlane Timeline report, individual data files have to be reopened back in Microsoft Project or Excel before any updates can be made. This causes a good amount of back and forth between Visio and Project/Excel before updates are visible. Custom milestone shapes can be designed to meet end user specifications. Custom milestones can be added to OnePager at any time, and do not not require a major release cycle. Additional data columns can be displayed on the chart if users need space to annotate resource, status, or other text-based information. Microsoft Project and Excel are the only data source driving a OnePager chart and cannot be corrupted. Task/milestone dates are always be based on real data. Percent complete values are always be based on real data. Visio documents can be unlocked and edited free-form, creating room for inaccuracies in the timeline. Percent complete values can be dragged out of sync with the project plan. The time axis can be overwritten manually instead of adhering to a strict calendar. OnePager is 100% read-only and never makes any changes to the underlying Microsoft Project or Excel data. This ensures that the project plan remains a clean, consistent source of record. Before importing data, Swimlane Timeline makes noticeable changes to several key Microsoft Project fields. If the user were to accidentally save the project file, the changes made by Swimlane Timeline could potentially impact the accuracy of the core project data. Most corporate IT departments disapprove of third-party applications making unauthorized changes to their data, no matter how trivial those changes may seem. Microsoft is a registered service mark of Microsoft Corporation. Product comparison made in October, 2016 between Swimlane Timeline 7.4 and OnePager Pro & Express v5.3. Feature comparison subject to change in future versions.